Leading neocons in Washington have sharply criticized former Massachusetts Gov. Mitt Romney for questioning America's role in Afghanistan during Monday night's Republican presidential debate in New Hampshire. "I want those troops to come home based upon not politics, not based upon economics, but instead based upon the conditions on the ground determined by the generals," Romney said. "But I also think we've learned that our troops shouldn't go off and try and fight a war of independence for another nation. Only the Afghanis can win Afghanistan's independence from the Taliban." On Tuesday, Sen. Lindsey Graham (R-S.C.) suggested that Romney's somewhat skeptical posture toward the current Afghanistan policy risked ceding national security ground to President Obama. "From the party's point of view, the biggest disaster would be to let Barack Obama become Ronald Reagan and our people become Jimmy Carter," Graham said, according to The Hill. Danielle Pletka, vice president for foreign and defense policy studies at the American Enterprise Institute, told Politico's Ben Smith that Romney was adopting an isolationist posture. 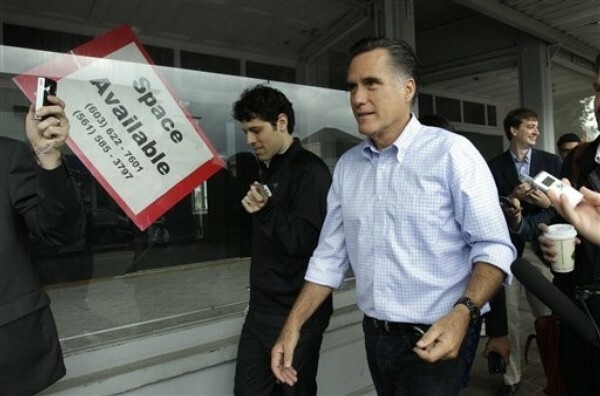 "Romney has proven himself a little bit of a weathervane, and I guess he senses that positioning himself in this place is good for his campaign -- attempting to appease Ron Paul's constituents without actually being Ron Paul." In response to the criticism, Romney adviser Eric Fehrnstrom reiterated the governor's support for the war, but highlighted his point that the U.S. cannot decide Afghanistan's future militarily. "Governor Romney supported the entry into Afghanistan and the surge to prevent the country from being a launching pad for terror," Fehrnstrom told the Washington Post's Jennifer Rubin. "What he wants to see now is Afghan leadership step up in a way that's been missing. They need to show the passion for liberty that is essential for independence." While Romney's comments have attracted significant attention due to his current lead in national polls for the Republican nomination, they are just one in a series of examples that signal the party's souring attitudes toward nation-building and shift away from foreign military interventions that don't have national security implications for the United States. The number of House Republicans opposing the current policy in Afghanistan has tripled in the past year, and last week the House passed Speaker John Boehner's resolution chiding the White House for not providing Congress with justification for the mission in Libya. Then, on Tuesday, Boehner warned the president that he would be in violation of the War Powers Act if he didn't seek congressional approval for the military action in Libya. During Monday's debate, Rep. Michele Bachmann (R-Minn.) reiterated her opposition to the military intervention there. "We were not attacked," Bachmann said. "We were not threatened with attack. There was no vital national interest." She continued: "We to this day don't yet know who the rebel forces are that we're helping. There are some reports that they may contain al-Qaeda of North Africa. What possible vital American interests could we have to empower al-Qaeda of North Africa and Libya? The president was absolutely wrong in his decision on Libya." Soon-to-announce presidential candidate Jon Huntsman, the former governor of Utah and ambassador to China, suggested decreasing U.S. troop levels to "10,000 or 15,000" in Afghanistan. "The very expensive boots on the ground may be something that is not critical for our national security needs, nor is it something we can afford at this point in our economic history," he said Tuesday. Mississippi Gov. Haley Barbour, who flirted with a presidential run earlier this year, has also questioned U.S. goals in Afghanistan. "I don't think our mission should be to think we're going to make Afghanistan an Ireland or an Italy," Barbour said in March. And Bing West, a former Marine, assistant secretary of defense under Ronald Reagan and author of "The Wrong War: Grit, Strategy, and the Way Out of Afghanistan," has argued that the war in Afghanistan represents a fundamental misuse of the military. "Our generals ordered our soldiers to be nation-builders -- a giant Peace Corps in armor," he told National Review in March. "Afghanistan was the wrong war for that misguided strategy." These views, as well as Romney's comment about Afghanistan and Bachmann's about Libya, highlight the party's increasing distance from neoconservative orthodoxy. They are also in line with an increasing number of Republican voters across the country. According to a recent CBS News poll, 56 percent of Republicans want to reduce the number of American troops in Afghanistan.